Reversible knits and crochet give you various options for your wardrobe. On this episode of Knitting Daily TV host Eunny Jang and experts Clara Parkes, Kristin Omdahl, and Shay Pendray explore reversible fashions. Eunny begins this episode with examples and demonstrations of reversible fabrics. Just because something is reversible, doesn't mean its exactly the same on both sides. This reversibility is displayed with the Chincoteague Jacket by Lisa Jacobs from the Spring 2012 issue of Interweave Knits magazine. By making this jacket with reversible stitches and with different buttons on each side, this jacket gives the wearer two different options. 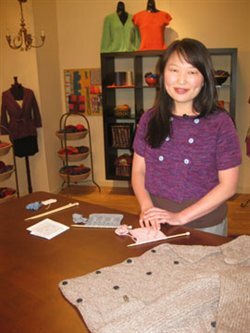 Eunny is wearing the Peony Cardigan by Cecily Glowik MacDonald, featured in the Spring 2012 issue of Interweave Knits magazine. On this episode's Accessorize Me! segment, Eunny joins crochet expert Kristin Omdahl with a reversible crocheted mobius design that is made of strips of crocheted fabric. 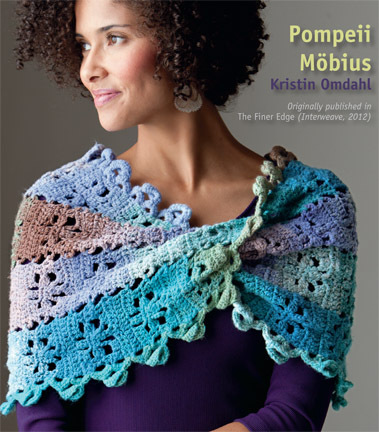 This Pompeii Mobius design is from Kristin's book The Finer Edge. Download the free pattern today! 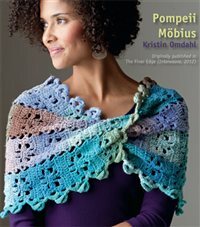 For more detailed information about the Pompeii Mobius, purchase the entire season of Knitting Daily TV 900 on DVD or as a digital download and get a free bonus segment with Kristin that dives more in-depth into this mobius and crochet design elements. Eunny and Clara team up once again to discuss locally spun fibers and yarns, something that may be important to you in your quest for supporting local North American companies. On this Yarn Spotlight Clara discusses Buffalo Wool Company's Earth yarn, a yarn completely made in North America from Bison down and nylon. Clara will discuss why this tough animal makes deliciously soft yarn as well as the best uses for bison yarn. Also featured on this segment is Louet's Easport Alpaca. Sponsored by Buffalo Wool Company. Lastly on episode 903 Eunny teaches viewers how to make an invisible seam so your reversible fabrics can stay that way. For more tips, techniques, and free patterns from Knitting Daily TV, visit KnittingDailyTV.com. Get the entire Series 900 of Knitting Daily TV on a 4-Disc DVD Collection! Click here to purchase DVDs and individual episodes of this season (available July 2012) or previous seasons of Knitting Daily TV.